Photos have the power to tell a story and preserve memories, in a different way than any other medium. Capturing a snapshot can transport you into another place and time. It’s no surprise that travelers and tourists have come to value photography as a priority as they make their way across the world! What you see and experience can be captured like never before. Seeing pictures of beautiful destinations is one of the top ways to get travel inspiration, and Morocco is up there with the best of them! Morocco is one of the most picturesque countries that I have ever visited. Whether you are looking for vibrant colors or fantastic scenery shots, Morocco has it all. You will fall in love with the natural beauty of the country as well as the rich cultural and architectural heritage. But with so many options…what places do you make a priority? 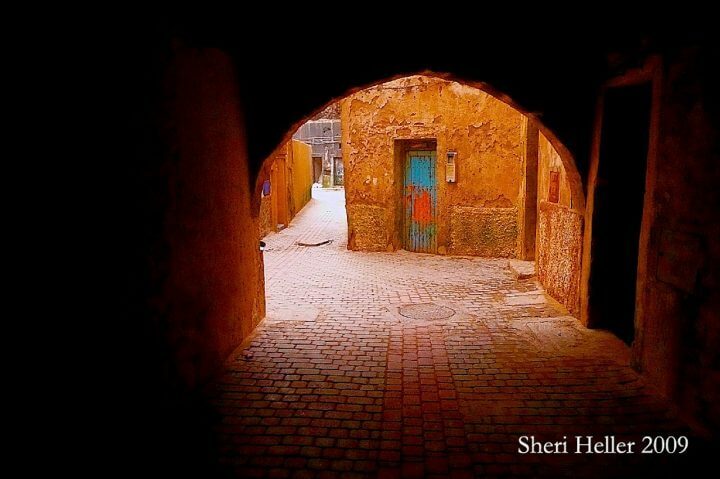 If you are planning a trip to Morocco, make sure to include these amazing photographic sights. From local treasures to large landscape views, these are some of the best places in Morocco for photographers! 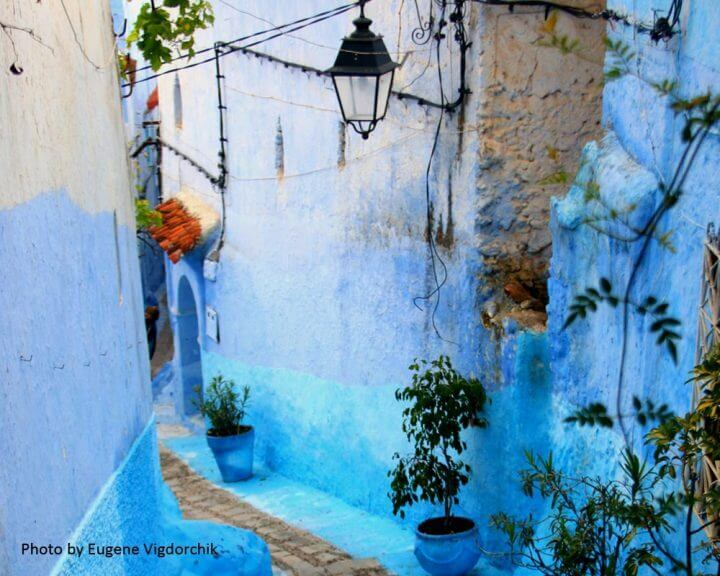 In my opinion, the most picturesque location in Morocco is Chefchaouen. Its buildings are nestled along the hillside, creating a patchwork of blues. The different hues and shades make the whole city feel like a fairytale. Light blue, bold dark blue, royal blue…around every corner you’ll find another stunning scene, full of serenity and spectacular little details. Chefchaouen is known as the “blue city” or “blue pearl” of Morocco because of the gorgeous blue coloring of the whole city. Throughout the day you’ll have different opportunities for photos as the sun changes and transforms the landscape. 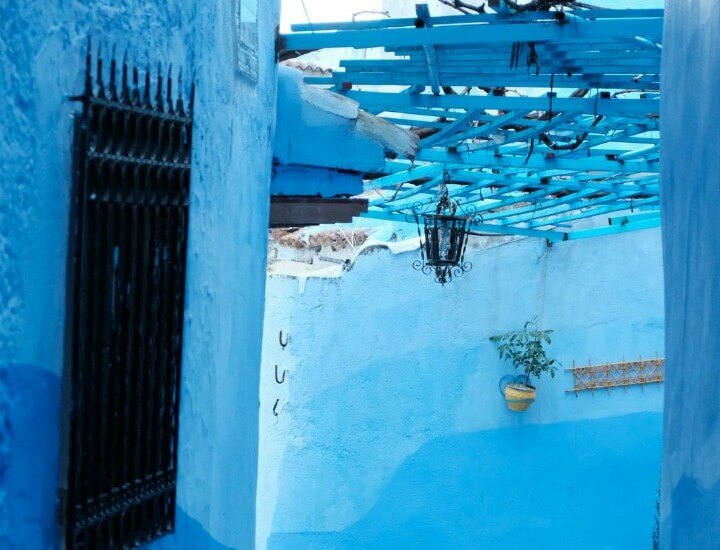 Chefchaouen is growing as a tourist destination, but if you wake up early, you can still find the streets mostly empty or with a few locals going about their business. It is also a small town, so it feels more manageable to explore on your own. You’ll have the time and space to really let yourself get lost in the magical streets. Wander aimlessly and explore brightly colored artisanal crafts that pop against the blue background. Chefchaouen is located in the Rif mountains, so if you have the time, consider leaving the town to get some shots of nature and a higher view of the city. 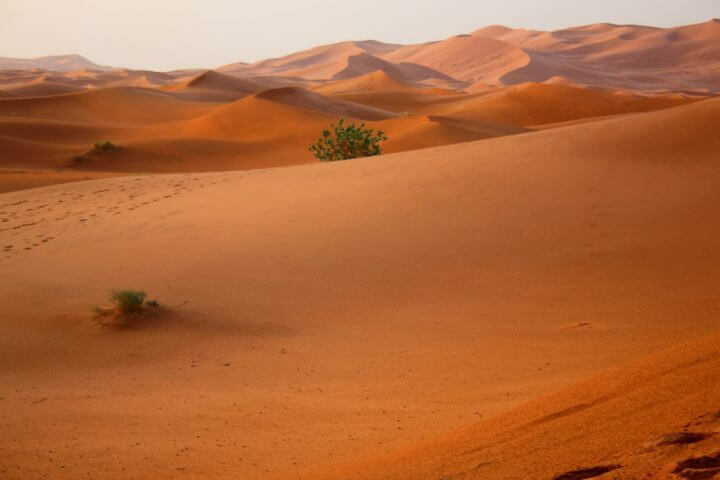 In a close second are the golden dunes of the Sahara desert. What I love about taking pictures in the Sahara is the variation in the different shades of sand. Depending on the time of the day, the sea of sand shifts in colors of vibrant reds, oranges, and yellows. If you plan out your visit well, you can even be on the dunes for the sunrise or sunset. The lighting at the beginning or end of the day is truly unforgettable. Imagine the beautiful coexistence of the endless lines of the dunes with open sky. 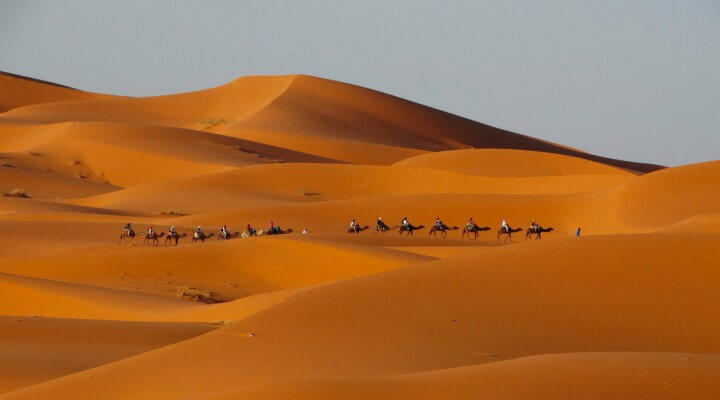 You’ll never run out of breathtaking images, especially because the Sahara is more than just sand! As harsh of an environment as it is, the Sahara is still the home to some, including camels. Riding camels, or seeing them walking across the dunes from afar, makes for lifelong memories! Play with silhouettes and shadows. The options are endless! 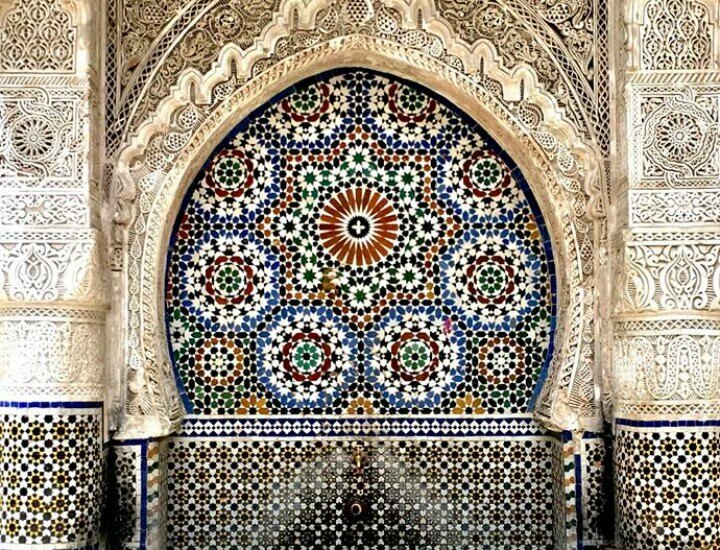 The city of Fes has the largest medina, or ancient walled city, in the world! Exploring this historical city is filled with opportunities for amazing photos. 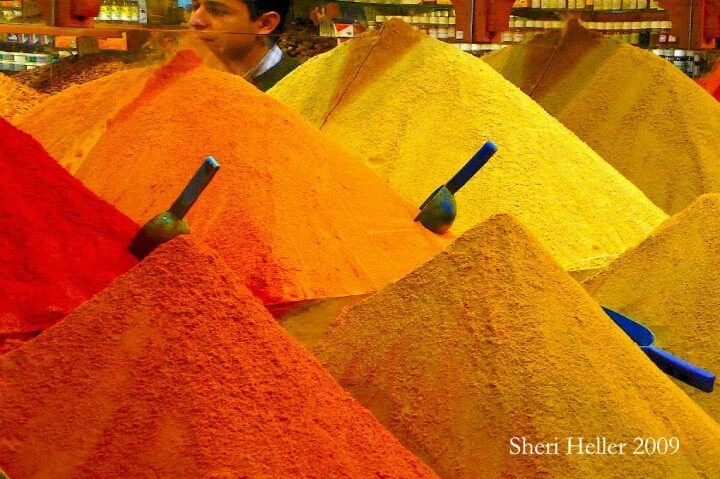 As I have been walking with people through the souks (markets) of Fes, most of our visitors stop to take pictures of the bags of carefully heaped spices. The range of autumnal hues contrast the blue of the bags and I always wonder how the peaks can stay so perfectly formed. Open markets offer a wide range of goods and products that you might not find at home. 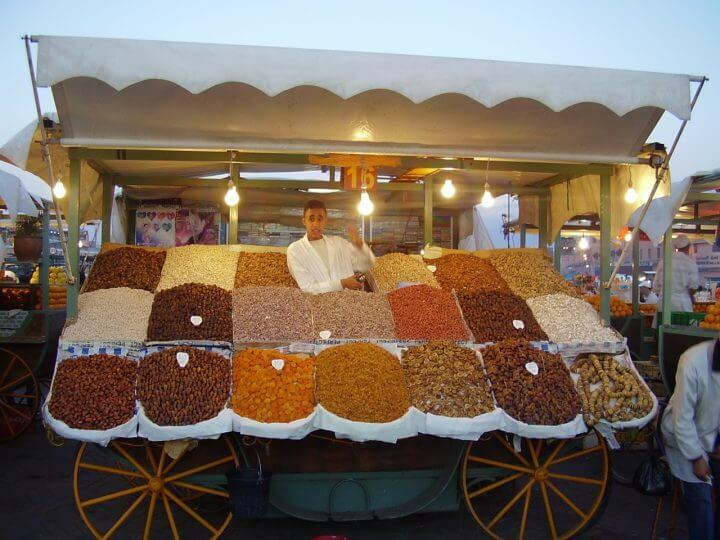 Even just the placement and presentation of such spices, dried foods, and nuts are picturesque on their own. Tucked away from the bustling markets, you can take refuge with a cup of tea in one of the carpet houses. You’ll be blown away by these handcrafted carpets. The attention to detail and the warm combination of colors and variety of designs will catch the eye of any photographer. After living for 10 years in the ancient city of Fes, I was amazed to see how many people stopped to take pictures of the winding alleys near our home. If you wait for just the right lighting, you will be mesmerized by the complex combination of shadows cast by arches and doorways. Taking a minute to open your eyes to what’s right in front of you can give you the best photos of all! You can spot ancient water clocks and tiled fountains in the most common of places. Beauty can be found in the smallest of moments from ordinary life, and Fes is one of the best places to see that. This small town along the Atlantic coast is lesser known gem among what Morocco has to offer. The blue and white buildings created a haven of peace for tourists and locals alike. While Essaouira is a popular destination of those who love to surf and windsurf, its natural beauty is great for photography as well! Miles of ocean waves mirror the ramparts that line the sand shores in between. Your camera will have so much to capture, from the old city streets to the sunsets over the water. 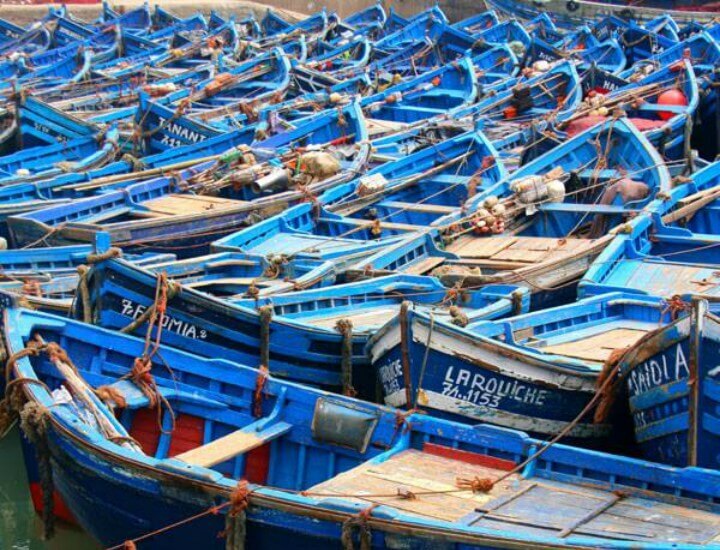 One of the most iconic images of Essaouira is the bright blue fishing boats lined up in the port. See if you can catch a seagull in action! Registered as a UNESCO World Heritage Site, this historical beauty is a must-see! This group of buildings is a traditional pre-Saharan habitation. The earthy colors and materials of the walls feel like you’re in another world, or at least another time! There’s so much to explore, surrounded by stunning nature and views. The mix of architecture and organic scenery is striking. This area has been used for many movie shoots. If you are a serious photographer, consider adjusting the timing of your itinerary so that you can be at Ait Ben Haddou while the light is good in the earlier morning or before sunset. By day, explore the lovely gardens that Marrakech has to offer! The Jardin Majorelle, or the Majorelle Garden, is absolutely amazing. This historical garden contains a lush green get-away from the red bustling city of Marrakech. Among the plants and water features, you can also see the incredible museum dedicated to Berber art and culture. 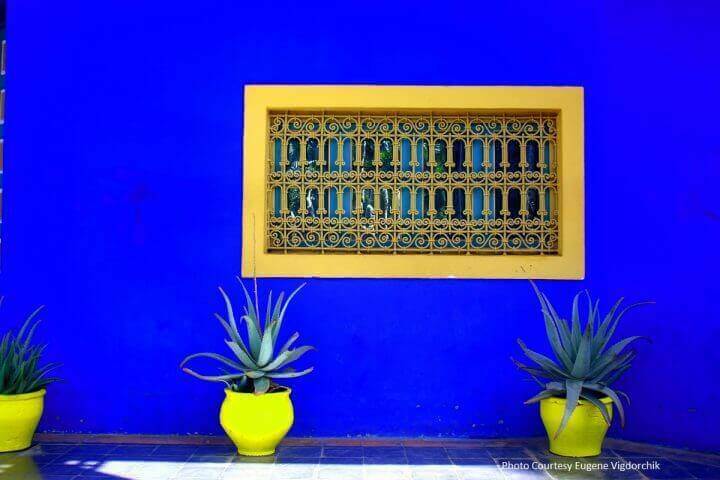 Vibrant colors cover the buildings, walls, plants, trees, and tiles. Started by the French artist Jacques Majorelle and later restored by the famous Yves Saint Laurent, this oasis has been carefully curated to be a feast for the eyes as well as the heart. Get your camera ready and take in every little joy. Another mind-blowing photo opportunity is the Jemma El Fna by night. If you can climb up on one of the surrounding buildings, you can capture the blend of smoke and lights. You may need to bring a small tripod so that you can effectively record the scene in the low lighting. A rooftop view of the famous square can give you a sense of the liveliness of Marrakech, with all the peace of a quiet, little cafe. As you prepare for your trip to Morocco, make sure you bring an appropriate camera so that you can record these memorable scenes. Most of our travelers, even if they aren’t serious photographers, write us and say that at the end of their trip they are sorting through thousands of photos and getting to relive their happy memories! We want to help you as much as possible to get the photos you are looking for in Morocco. However, it’s important to be aware of good photo etiquette in Morocco before you go! Did you know you can easily offend while taking pictures? You’re on vacation, traversing lands you have never seen before, foreign and different than anything you’ve seen before; it’s hard to resist capturing every moment. You are soaking up so many new experiences: the culture, sights, and sounds. Totally engrossed in whats before you, how can you keep from documenting it all? Yet you need to stop for a minute and think before you take that picture. Not everything abroad is okay to photograph. In the end you will be better off to err on the side of caution. The last thing you want while traveling is to unknowingly bring trouble upon yourself. Because photos are one of the best things we can bring back from our trip, we can sometimes become more daring than we are at home. Lost in the moment, we can forget about the implications of our beautiful shots. It’s easy to be carried away! When you see the perfect frame, ratio, and lighting, your artistic instinct is to whip out your camera. However, photography etiquette should be a real and important concern for any traveler. Even when enjoying your trip to the fullest, being cultural appropriate should be in the back of your mind. When in doubt, heed the golden rule of photography: never assume. Make it a habit to ask before shooting. Understandably, this isn’t going to be possible all the time, but you can try! Here are some of our top tips for being respectful as a photographer in Morocco. 1. It’s Always Good to Ask! This usually gets a positive response. You’d either get a nod or shaking of the head to signal a yes or a no. These signals are understood…no need for translator! And of course, respect their decision. If they say no, move on. If they say yes, express your appreciation (sometimes it’s appropriate to tip them – your guide can help you navigate the culture!). Asking for permission to take photographs of foreigners often presents a good opportunity to strike up fun and interesting conversations. Take your time – get that angle just right. You might be tempted to pretend that you’re taking a picture of something behind them to avoid awkwardness. But it’s much better to embrace engaging with locals. Throw off any spirit of shyness or shame! Even with language barriers, smiles speak universally. Being friendly can go a long way and often opens the door to new friendships! Let them know they’re in the frame. You never know what surprises might come! A gorgeous picture is a treasure, but having a memory and story behind the photo is even better. Memories become even richer when we allow for unexpected interactions, adventures, and relationships. Getting to know your subject always makes the experience more memorable. A name to a face, a story to scene, the backstory can bring pictures to life for years to come. Invite your new friends to see how the photos turned out! Wouldn’t you like to see a photo of yourself somebody just took? Photographing kids and showing them the outcome of the photos can be fun on all accounts. Kids especially are usually willing and happy to strike whacky poses in front of a camera! You know shortly after you snap the photo, a cute thunder of laughter and screams of excitement will break out. The more joy, the more there is to share! The giving doesn’t have to end here; if you happen to have a Polaroid, give away some copies. Now that’s the gift of sharing! Being sensitive to people’s privacy, religion, and cultural customs are all part of being a conscientious traveler. In this case, doing unto others as you would have them to unto you goes a long way! Put yourself in the locals’ shoes. Would you want tourists and foreigners to be insensitive towards your own beliefs, customs, or privacy? Of course not! The common sense and compassion you have can tell you this. But, sometimes it can be hard to see from the perspective of people that are different than us. Even though it might be difficult, it is always worth the effort! This act will enhance your experience of your destination as well as make you a better guest. What’s acceptable in your home country or town might not be acceptable in other places. Snapping photos in certain places or situations simply isn’t appropriate. Think twice about taking pictures of local living conditions, religious processions or practices, funerals, and those suffering in some form. Coming into contact with people suffering from various ailments, diseases, or other injuries shouldn’t be taken as an opportunity to get a memorable or shocking photo. These events and realities are a part of everyday life, yet they’re also too private or personal for strangers to be documenting. Respect for the land you’re visiting and the people who host you reaches farther than what to say and not say. Use an extra dose of caution and hesitancy when taking pictures of such situations. No matter how tourist-friendly the place seems, always keep your eyes peeled for signs prohibiting photography. Typically, cultural places or sanctuaries, churches and museums will prohibit all kinds of flash photography. You may however come across places that allow photos as long as you avoid using the flash. Drones are most often not allowed within buildings, exhibits, or other local sights. Certain other restrictions may apply to specific camera equipment that goes beyond what might be considered standard. When in doubt, always ask an employee or nearby local. It’s also important to do your research before bringing your equipment. Some photography equipment is not allowed to be brought into Morocco – check online as best as you can, or ask someone who lives in Morocco what is possible! 6. No Need to be a Problem! As people go about their daily routines, there’s no need to interfere or get in the way. Being a nuisance or generally disruptive can sometimes look like taking pictures without giving a second thought. For locals, the day of your visit is just another day in the life! They have jobs to do, places to go, and people to see. Again, if you are unsure of what to do or whether something would be a bother to those who live where you’re traveling, simply reverse the roles. Think about how you would feel in a similar situation. If it’s something that would annoy or disrupt you, then it’s best to choose an alternative action. Extend the same courtesy to others that you would like extended to you. Besides, by not respecting their space, you are inviting an overall not so positive experience. As a result of rushed photographs you often end up with unpleasant facial expressions and more awkward moments. Take your time to be respectful and everyone has a better experience. It’s a good idea to have your camera “locked and loaded” if you’re taking pictures in popular or busy tourist spots. You don’t want to block the sidewalk as you fiddle with the camera settings, trying to take photos in a hurry. Let’s be honest here: it is just plain embarrassing to have people glare at you while you fumble for the ideal set of settings and circumstances. These general guidelines aren’t meant to discourage you from travel photography. Just keep in mind that people’s personal space is important, no matter where you are. In most situations, all it takes is practicing consideration by asking. If you don’t know the answer to your questions or what is acceptable, consult an expert. Talking with those who have deep knowledge of the country, customs, and culture are the best sources. If you choose to travel with tour agency or company, don’t hesitate to ask for more specific information when it comes to photography! The goal of all of this effort is to make everyone’s day a little easier and a little brighter. When we travel respectfully and graciously, everyone wins. Photography is about capturing the essence and truth of a moment, so if you follow these tips you’re sure to have the best chance of fulfilling your travel photography dreams!